On this holy occasion of Eid-ul-Adha, try to spread happiness around you. It’s a great event of sacrificing. Muslims show their dedication to Allah (SWT). The best way to wish this event to others is, funny quotes, SMS, and poetry. Because the funny stuff brings huge smile on faces. 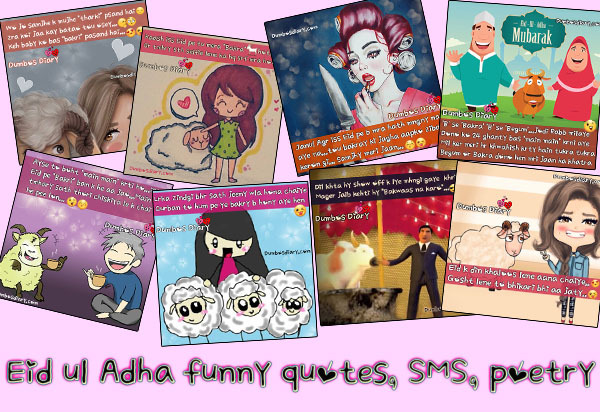 Here, I’m sharing best Eid ul Adha funny quotes, SMS, poetry in Urdu/Hindi with images. You can use these images as your “WhatsApp Status“, “Facebook DP”, “Instagram DP”, or “Twitter DP”. Share these funny images to your loved ones or friends to break them into laugh. First of all “Happy Eid-ul-Adha” or “Bakra Eid Mubarak” to all Muslims. Now scroll down my edited funny poetry or quotes images that going to bring a smile on your faces.